I painted this painting for some friends in South Carolina. It was a perfect fit for me because my favorite animal has always been the tiger. I even had a tiger stuffed animal when I was a child. I remember — don’t laugh too hard — that I would have these dreams that I was a tiger. I would do tiger stuff… trying to hunt for snakes in a river, playing with another tiger, etc. 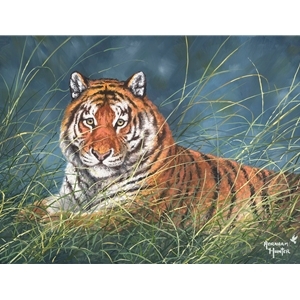 Every time I see a tiger, I think of how much I loved them as a child and how much I love painting them now because of the rich textures in their fur. Plus, they have eyes that look somewhat threatening but soulful, too. There’s a real strength behind their eyes. They have to exist in the wild, enduring the dangers. Yet, they still manage to come out on top and are survivors. That’s the way we should be. Despite all of the dangers in the world, we can have the Heart of a Champion inside of us. We can’t let the dangers in the world divert our focus from who we really are — we are champions, conquerors.